Dr. Kristie Yarmer, pictured here in her office at The Memorial Hospital Medical Clinic, is the first of two pediatricians coming to Craig to work in The Memorial Hospital’s new pediatrics program. “It’s exciting to get to be on the ground level of pediatrics here,” said Yarmer, who will begin seeing patients Monday. — A free lunch will be provided. No reservation is required. For more information, call Jennifer Riley at 826-3109. A wing of The Memorial Hospital Medical Clinic is in the final stages of a gradual transformation. Chairs furnish two waiting rooms in the nearly completed pediatric ward, and future examination rooms are painted in vibrant colors that will serve as a backdrop for circus animals and other child-friendly décor. And on Monday, the first of two pediatricians to practice in the remodeled wing began her first day on the job. 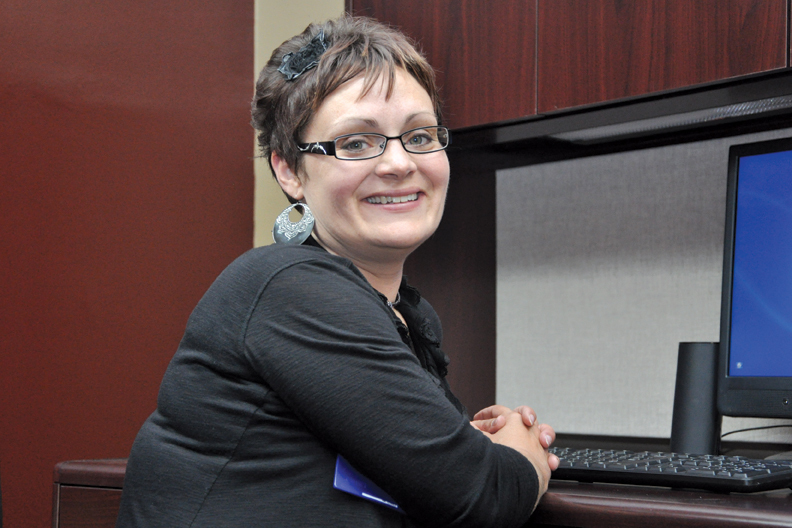 Dr. Kristie Yarmer will complete a week of orientation before she begins seeing patients July 9. Yarmer, who moved to Craig from Fernandina Beach, Fla., is looking forward to being part of an up-and-coming pediatric ward. “It’s exciting to get to be on the ground level of pediatrics here,” she said. For now she is the sole pediatrician in Craig, but Dr. Kelly Follett will join her in August 2013 after she finishes her pediatric residency at Primary Children’s Medical Center in Salt Lake City. Yarmer believes having pediatricians at the clinic will be beneficial to patients and the hospital. “It gives families more options because a lot of families want only to see a pediatrician, and I’m hoping that by coming here and getting this started, it will bring some people back,” she said. One of the more crucial aspects of Yarmer’s job includes early detection and referral for delays in language, fine motor skills and other development areas, she said. “The earlier they are referred, the better the outcome,” she said. She encourages parents to be active participants in their children’s care. Residents can learn more about Yarmer at this month’s Lunch ‘N Learn, the hospital’s free education series, scheduled for noon July 11 at TMH conference rooms A and B, 750 Hospital Loop. “She’ll be talking about the way she practices medicine and her philosophy (and) her experience,” said Jennifer Riley, chief of organizational excellence at TMH. Doors open at 11:45 a.m., and a free lunch will be provided at the event. No reservations are required. To schedule an appointment with Yarmer, call TMH Medical Clinic at 826-2400.